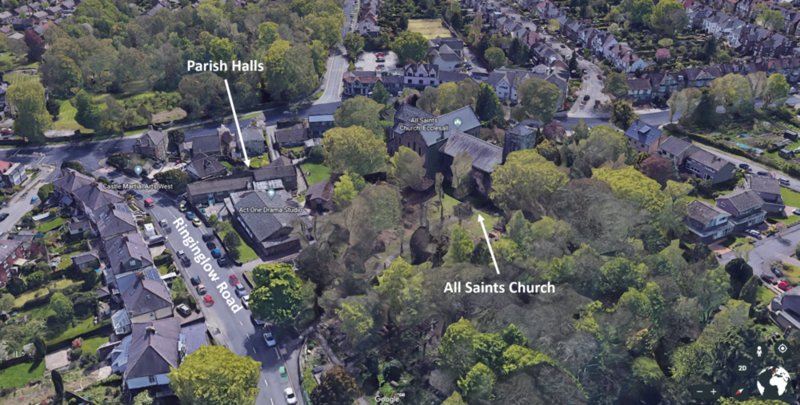 All Saints Church is located between Ecclesall Road South and Ringinglow Road and can be accessed from either road. All Saints Halls (and office) are located on Ringinglow Road. The Chapel of the Holy Spirit & Whirlow Spirituality Centre is located on Whirlow Grange Drive. The Church is most easily accessed from ringinglow road where there is typically pleanty of room to park and a bus stop at the bottom of the road. The Church consists of the Main church building and then slightly down the road the Parish Halls and church office are located. Below is a picture from Goggle Street view of the Halls Entrance.